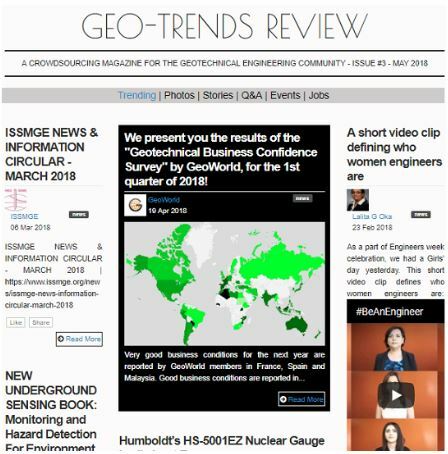 We are excited to announce that GeoWorld, the biggest online platform for geotechnical engineers, just published the third issue of “Geo-Trends Review” magazine. The first crowdsourcing-based content magazine in Geotechnical Engineering! The third issue was just circulated and you can see it here. The magazine is designed to reflect GeoWorld’s dynamic and unique content! Geo-Trends magazine, is full of news, members’ blog posts, questions, answers, and photo albums. Every issue is keeping geotechs in touch with what is trending in geotechnical engineering globally. It includes the hottest, most exciting news that our members post! If you want to be part of Geo-Trends Review Magazine you have to login to your GeoWorld account and update today your profile, post your blog posts, ask questions, share updates, upload photos and directly reach an audience of 8000+ geotechnical engineers. If you don’t have an account and want to participate, join GeoWorld now by clicking here! GeoWorld is part of Argo-E infrastructure network!